Ferrari's Sebastian Vettel beat title rival Lewis Hamilton in the Belgian Grand Prix to cut his lead to 17 points. Vettel passed Hamilton on the first lap just in time before a safety car was deployed following a multi-car crash at the first corner, and dominated thereafter. 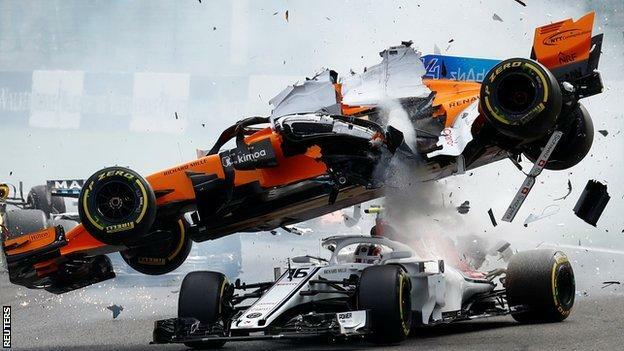 Fernando Alonso, Nico Hulkenberg and Charles Leclerc were uninjured after the German rammed Alonso's McLaren and launched it over Leclerc's Sauber. Hulkenberg received a 10-place grid penalty at the next race for the incident. Alonso related it to the first-lap crash at this race in 2012, in which Lotus driver Romain Grosjean was given a race ban for causing a similar incident, which also took out the Spaniard. "Again a very big-time missing braking point," Alonso said. "That time Romain had a race ban. "It is tough to understand how you can miss (the braking) so much. It is not a couple of metres. You arrive at a speed that it is impossible to negotiate the corner. So, sad for that but happy that we are all fine." The big difference between the 2012 and 2018 crashes was that Grosjean was a repeat offender in terms of first-lap crashes that year, while Hulkenberg is one of the sport's most consistent performers. The crash also may have been the first time a grand prix driver was saved from injury by the new halo head-protection device, introduced this year. Television replays showed Alonso's car bounced off the halo on Leclerc's car and Alonso said: "I flew over his car and the halo was a good thing to have today. I think for him it helped, looking at the replay. We don't need to prove it is a good thing to have." 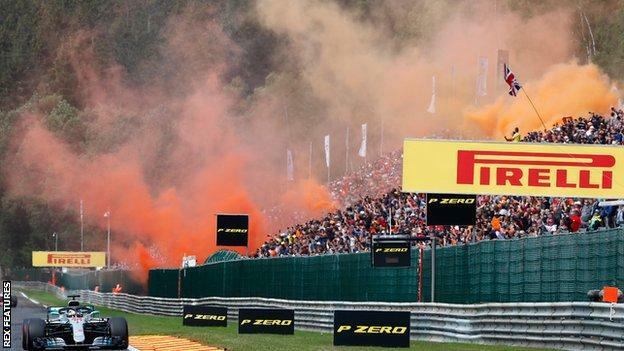 Hulkenberg, who was handed a 10-place grid penalty for next weekend's Italian Grand Prix for his error, said: "I misjudged my braking point a little bit and there was no real time to recover it. "Of course I can understand that he [Alonso] is upset and frustrated. So am I, and he has every right to be, but it is racing and these things unfortunately do happen." That was not the only incident at the first corner. Daniel Ricciardo's Red Bull hit Kimi Raikkonen's Ferrari, forcing both into eventual retirement despite initially rejoining. And Hamilton's team-mate Valtteri Bottas, starting from the back because of engine penalties, damaged his front wing and needed to pit for a new one. 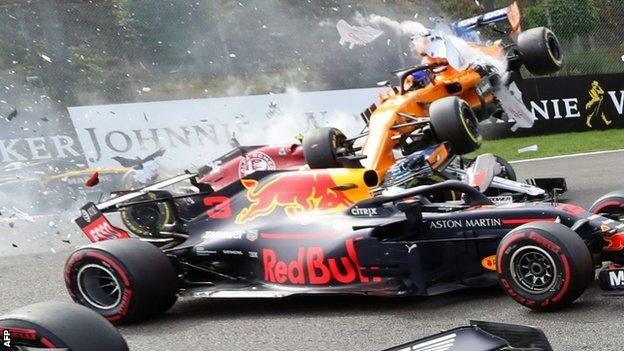 It seemed inevitable that a safety car would be deployed with so many damaged cars and debris on the track but race director Charlie Whiting delayed his call to deploy it for a crucial amount of time. Hamilton and Vettel were well clear of the chaos behind and the German tracked the Mercedes off the start, settled into its slipstream up the long Kemmel straight and swept into the lead. Vettel briefly had to fight off an attack from Force India's Esteban Ocon, who started third and tried a look down the inside into the Les Combes chicane at the same time. 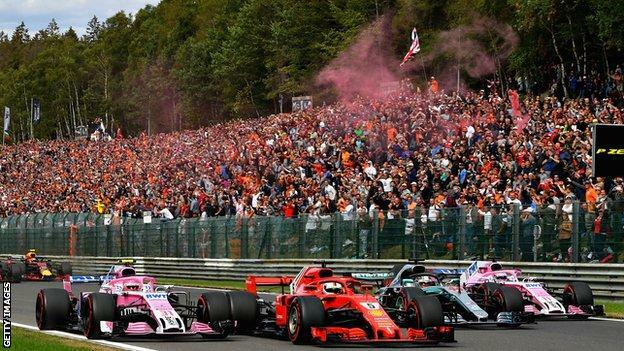 Vettel, Hamilton, Ocon and the second Force India of Sergio Perez were briefly all side by side down the back straight but the Frenchman had to back out of his attempt and that allowed Perez to slip ahead of him into third. Four cars going into the same corner battling for the lead: who says F1's boring? Once into the lead, it was clear Vettel had a small but decisive pace advantage over Hamilton and he edged clear, building a 3.9-second lead by lap 14, before the Mercedes began to close in slightly as the pit stops approached. Hamilton got his deficit down to 3.2secs on lap 20 and pitted on the next lap, but Vettel followed him in the next time around and was able to rejoin in front. Hamilton was not far behind but not close enough and his hopes were also marginally affected by catching Max Verstappen's Red Bull, which was running second, just as he wanted to be attacking Vettel. Hamilton passed Verstappen with ease up the Kemmel straight and was in any case too far back to have made an attempt on Vettel's lead. 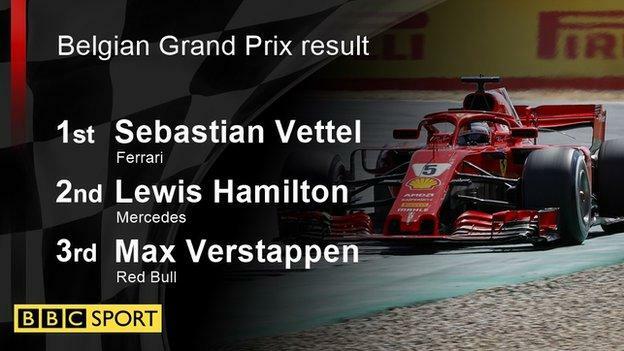 He ended the critical lap 1.5secs behind, after which the race settled into a familiar pattern, with Vettel building a comfortable lead of about five seconds or so and holding it there, and Verstappen equally safe in third nearly 30 seconds behind. After the initial drama at the start, the race was unexciting, the only significant action provided by Bottas' fight back through the field. The Finn got up to fourth before his stop on lap 32, which dropped him to sixth. He soon passed Ocon, and then Perez on lap 40 to take fourth. Fifth and sixth was a dream start for the sort-of new Force India team, which was rescued from administration over the summer break and is now owned by a consortium of businessmen led by Canadian billionaire Lawrence Stroll, father of Williams driver Lance. Classified as a new team, with the old Force India disqualified from the championship, they started with no points but have already leapt ahead of Williams into ninth, just a point behind Sauber.